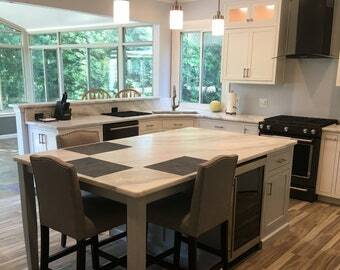 We bought this beautiful kitchen island to match the rest of our kitchen. The company was a pleasure to work with! They answered all questions I had and designed the island to our needs. We chose to get the matching granite countertop to the rest of our kitchen. We are very pleased with our purchase! We would highly recommend this company! When we moved into our house we needed a bit more storage space in the kitchen and I knew exactly what I had in mind, but I couldn't find anyone near me to create it. I found Todd's shop and worked with him on the design and the style/stone we were looking for to create out custom piece. It arrived last Wednesday and I cannot stop talking about it. It brings a pop of color to the kitchen without being too flashy and you can tell is extremely sturdy and well made. Even the movers who delivered it were so impressed with the craftsmanship that went into the piece. You can tell that time was taken to make sure it came out exactly as planned. We love it in our kitchen and I am so excited to use it for many years to come! 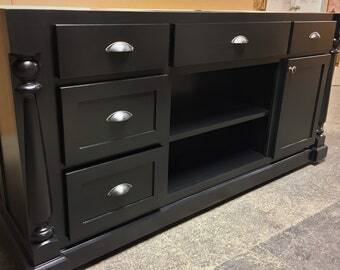 Kitchen island with tapered legs. 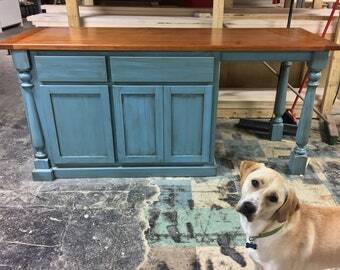 Custom kitchen island. My islands can be purchased without tops if you would like to use your own top. Built to hold heavy stone tops. 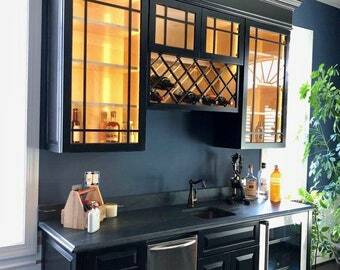 Custom kitchen cabinets and island. Todd Gladfelter, owner of Worthy’s Run Furniture has been crafting quality furniture for more than 17 years. Our made-to-order furniture is handcrafted with care and attention to detail. Finished to our exacting standards, it’s then shipped directly to your front door. We use quality lumber and reclaimed materials sourced from local family-owned mills and suppliers. All furniture is solid wood construction. Don’t see what you’re looking for? Items can be custom-built to your specifications. Let us know and we’ll work together to create the perfect piece for your home. WRF uses General Finishes Milk Paint, Stains and Finishes. Known for their quality and durability, you can choose from a variety of colors, glazes or stains to add the finishing touch. Worthy’s Run Furniture takes great pride in every project; customer delight is the foundation of our business. Thank you for visiting our shop. Beautiful quality furniture for every room of the house, enjoyed for generations to come. Todd Gladfelter, owner of Worthy’s Run Furniture has been crafting quality furniture for more than 17 years. Our made-to-order furniture is handcrafted with care and attention to detail. Gary Knoll has several years of experience in the home improvement field and has worked part time for WRF for 1 1/2 yrs. With his help WRF has grown and he now has taken a full time position in the shop. Michele is responsible for the beautiful finish on your custom piece of furniture. All my furniture is handcrafted in my shop. Solid wood construction and domestic maple plywood is used in building my furniture. You will be able able to pass this furniture down through the generations to come. Thanks so much for stoping by and browsing through my listings. If you don't see what your looking for or need the dimensions altered please feel free to message me your ideas or questions. Each piece is made to order therefore we cannot accept returns or refunds once the order has been placed. Lead time is approximately 8 - 10 weeks from time of deposit to ship date, and can vary based on the season and current workload. We work to keep you informed during various stages of the build. Shipping is not included in the price and is **NOT** free regardless of what the Etsy ad says. For estimated shipping and handling costs, please provide your city and zip code. We’ll do our best to provide an accurate estimate, however we cannot guarantee the exact cost. We do not profit from s&h; actual delivery time will depend on finish date and shipping method. We use Fedex Freight and R&L Carriers. This is curbside delivery and you will be responsible for getting your piece of furniture into your home. Delivery drivers are not permitted to enter your home. They will call you to set up a delivery time so you will have time to arrange help if needed. We also offer optional lift gate service. Please inspect the crate or box for any vissible damage before you unpack. Take pictures of any damage and make note on the bill of lading. Do NOT sign it before you unpacked and inspected. At the present time, we currently ship only within the continental U.S. and Canada. Worthy’s Run Furniture takes great pride in every project; customer delight is the foundation of our business. If you have any questions, please feel free to contact us. We strive to work with our customers during each stage of the project. We do offer wholesale pricing on our products. Must provide a valid resale certificate. Min purchase is 3 islands of any size. For more information please message me. Many people ask if the top is unattached or removable. The answer to both questions is yes. We send them unattached and on the same pallet as your cabinet. This makes it easier to unload from the truck and also get it in through your doorways.